Looking under a microscope, you can see the circuitry that makes up the chip. The yellowish lines above are the metal traces that connect the circuits of the die. The reddish and greenish regions are the silicon of the chip, forming transistors and resistors. The black blobs around the edges show where tiny bond wires connected the die to the integrated circuit pins. I’ve outlined the analog circuits outlined in purple, while digital circuits are in cyan. 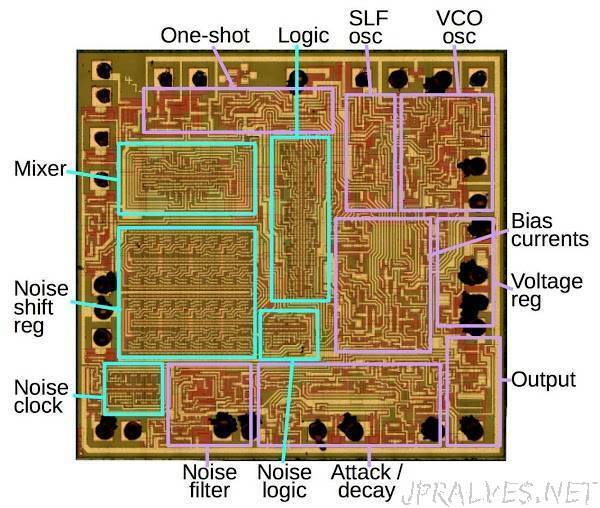 The 76477 is primarily analog—most control signals are analog, the chip doesn’t have digital control registers, and most sounds are generated from analog circuits—but about a third of the chip’s area is digital logic.